Be ready to greet your customers with open arms this St. Patrick’s Day when you send out shamrock die cut postcards. Perfect for bar and restaurant marketing, these fun cards measure 4” x 6” and include a die cut pop out in the shape of a shamrock. The die cut won’t interfere with mailing and allows for creative designs that will get your customers talking. You can use the pop-out as a coupon if you’re running a St. Patrick’s Day promotion. The cards are printed in full color on both sides of 14pt ultra-thick cardstock. You can add a high gloss UV coating or matte finish to your shamrock card at no extra cost. St. Patrick’s Day is a bonanza for any establishment that serves alcoholic beverages. This day of revelry brings in crowds wanting to party and raise a cup in honor of Irish ancestry, St. Patrick, or just for the fun of it. 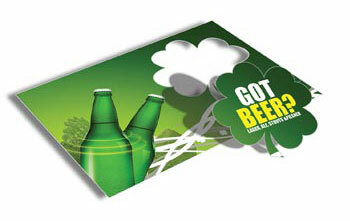 Advertise your eating or drinking establishment as the place to be for the holiday with shamrock die cut postcards. We have a template gallery of free St. Patrick’s Day designs you can browse and customize, making it simple for you to make the most of this year’s holiday. Use our convenient and free online design center, where you’ll be able to type in your business name and other details to make the card yours.